"It belongs in a museum!" Indeed it does. Or maybe on your wall, in your living room, next to your big TV and endless collection of DVDs. Yea that's the perfect spot for this art print. 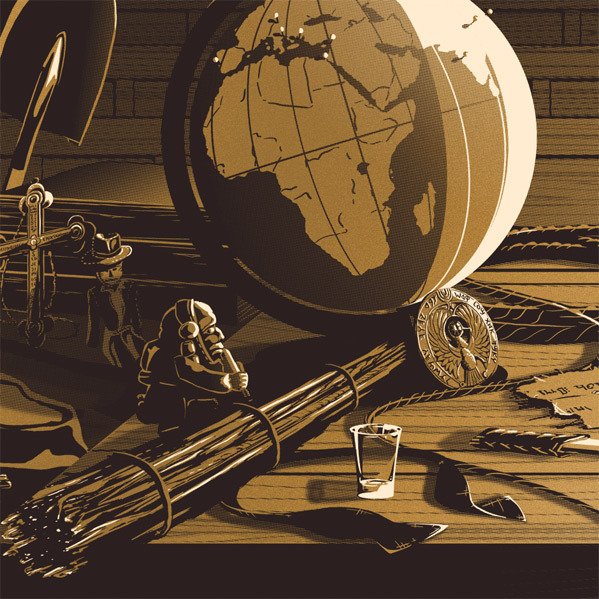 Our friend Rob Loukotka, who goes under the name "Fringe Focus", has recently debuted a new print called The Desk of Dr. Jones and it's awesome. Loukotka's style utilizes very, very tall (or very wide) prints that feature lots of lush detail. This time he has decided to imagine what the desk of Indiana Jones would look like, featuring some of the famous "MacGuffins" and artifacts he has collected/stolen/interacted with at various points in his wild life. "This is the 2nd poster in my series of illustrations of Famous Desks! First Tony Stark, now Indiana Jones. Few movies (or trilogies) are as rich in detail and beautiful objects as the Indiana Jones trilogy." Here's the awesome print he made showing Tony Stark's "desk", or more like his workshop, from the Marvel Universe. Both of these fine movie prints were made by Fringe Focus and are being sold directly by him in his own shop. Referring to the "The Desk of Dr. Jones" art, Loukotka explains: "the illuminated golden fertility idol from Raiders of the Lost Ark, the sacred stones from Temple of Doom, the Holy F***ing Grail from The Last Crusade. The magnitude of amazing objects in these films is second to none. I realized this as I was taking notes to build my drawing list, and I could not stop. This unofficial kind-of-a-movie poster packs over 40 items from the films into one scene." This limited edition fan art is available now through his store here. The regular version is being printed with metallic gold ink (!!) on cream paper, with a framed version also available. It's this kind of art that is yet another reminder of why we love movies. Fine work as always, Rob. Seriously cool. The Tony Stark one is great too. I like how he included the bowl of "Bad dates"